What’s great about the E2800? A good while ago now I put a post together about some great target storage repositories these included Cloud Integrated Storage, The Cisco C Class range which now the S3260 is a great “Appliance” one stop shop for compute and high density storage and the post regarding a SAN backup appliance. Each have their own use cases and rights and maybe if you are interested we can have a discussion on those use cases and where you would see one over the other etc. 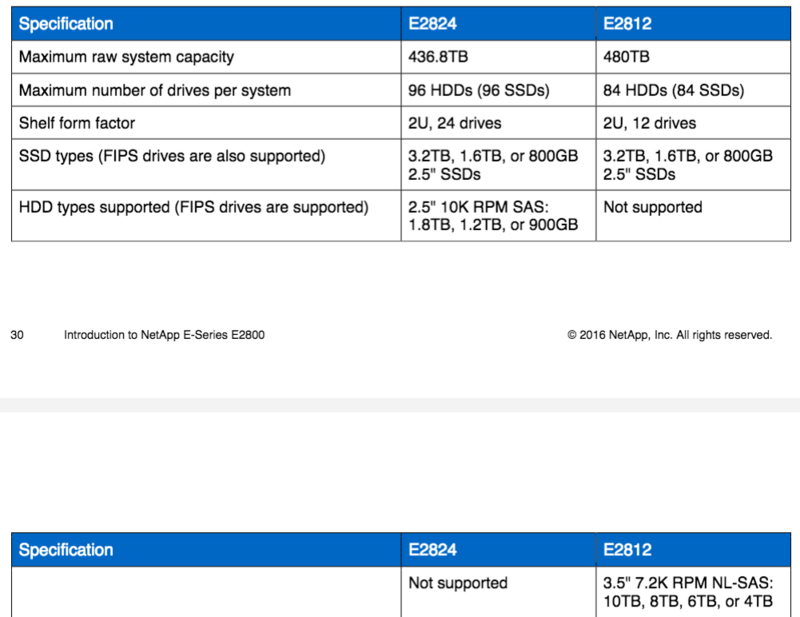 I am talking about the blog post I put together regarding the NetApp E2700 or in fact the whole E Series family from NetApp as a great SAN backup array. But let’s just touch on some of the benefits of using an E Series for your backup target. I mean there is no storage efficiencies involved… why would I put my backups on there I hear you cry? Well to some it’s not about those efficiencies sometimes it’s about the recovery speed and from certain SANs it’s going to fly because of there are none of those efficiencies. But some and this is my favourite use case, some like to be able to leverage their backup storage for testing and development and having some good performance under the hood on that secondary storage array is a great way to achieve that. 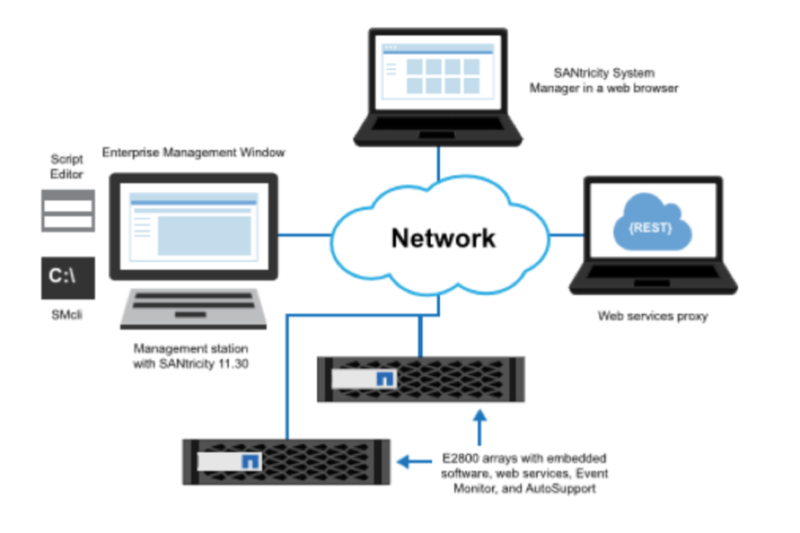 Before Christmas towards the back-end of 2016, NetApp released their E2800 which is where I am going to focus this post on and really about some extra features that they have added to this portfolio product. Let’s summarise the E2800 before moving on, a well-balanced storage system for performance and capacity with the ability of handling large sequential I/O as well as small random I/O requirements for small and medium-sized enterprise mixed workloads. There are two shelf options which will support both hard disks and solid state disks. As you can see from the image above both shelf options are the same 2U chassis however the difference is if HDD or SSD are being used. The new automatic load balancing feature provides automated I/O workload balancing and makes sure that incoming I/O traffic from the hosts is dynamically managed and balanced across both controllers. The workload of each controller is continually monitored and, with cooperation from the multipath drivers installed on the hosts, can be automatically brought into balance whenever necessary. For more information, search for “what is automatic load balancing? “in the System Manager online help. The maximum volume size for a standard volume in a disk pool has increased from 64TB to 1PB for E2700 and E2800 storage arrays and to 2PB for E5600 storage arrays. The maximum volume size for a thin volume in a disk pool has increased from 64TBto 256TB. For more information, search for “learn about volumes “in the System Manager online help. SSD read cache. Accelerate 85% or higher random read workloads using a few SSDs. Recommended to accelerate 85% or higher random read workloads. The E Series storage system is managed by a software management OS called SANtricity. With the latest release of the E Series hardware platform comes a new version of the OS in the version of 11.30. E2800 storage systems use a modular approach to hardware configuration. This approach can meet most customer SAN storage requirements for flexible host interfaces and versatile drive choices without sacrificing supportability, ease of implementation, and long-term stability-Series has a proven track record of reliability and scalability to satisfy requirements in remote dedicated environments or primary data centers. The E-Series E2800storage system allows customers to cut operational costs with ultra-dense drive shelves for capacity-hungry applications while improving storage utilization with the intuitive, easy-to-learn SANtricity System Manager 11.30 and popular application management integration software. E2800storage systems offer balanced throughput performance for backup, video, and analytical environments and other sequential workloads, but they also support demanding IOPS workloads in small and medium enterprise data centres. The wide choice of drive speeds, capacities, and storage features combined with multiple host connectivity interface options makes the E2800-based storage system the perfect choice for environments where simplicity, seamless integration with wide-ranging workloads, and a streamlined price/performance product focus are the key elements to customer success.